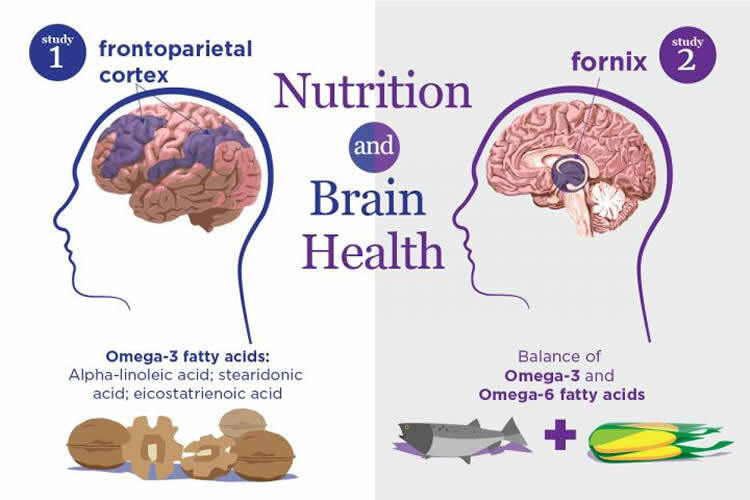 Summary: Researchers add to evidence that omega 3 and omega 6 fatty acids promote health brain aging. Source: University of Illinois at Urbana Champaign. “We studied a primary network of the brain — the frontoparietal network – that plays an important role in fluid intelligence and also declines early, even in healthy aging,” Zamroziewicz said. Fluid intelligence describes the ability to solve problems one has never encountered before. New studies link specific nutrients to the structure and function of brain regions that are particularly sensitive to aging and neurodegenerative disease. NeuroscienceNews.com image is credited to Julie McMahon. Funding: This research was supported by Abbott Nutrition. Image Source: NeuroscienceNews.com image is credited to Julie McMahon. Original Research: The study will appear in Nutritional Neuroscience. University of Illinois at Urbana Champaign “Healthy Brain Aging Linked to Omega-3 and Omega-6 Fatty Acids in the Blood.” NeuroscienceNews. NeuroscienceNews, 18 May 2017. University of Illinois at Urbana Champaign “Healthy Brain Aging Linked to Omega-3 and Omega-6 Fatty Acids in the Blood.” http://neurosciencenews.com/omega-3-6-brain-aging-6712/ (accessed May 18, 2017).